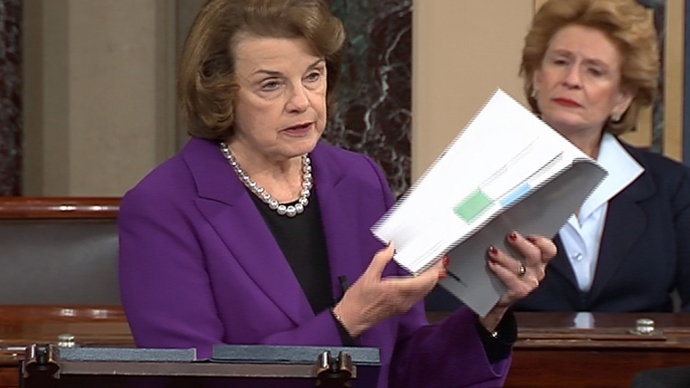 Following the arrest of two women in New York for allegedly conspiring to build a weapon of mass destruction, Sen. Dianne Feinstein (D-Calif.) called for the banishment of a bomb-making book and an Al-Qaeda-published magazine from the internet. Feinstein is currently Vice Chair of the Senate Select Committee on Intelligence, but under her chairmanship of the committee, which ended last year, she was responsible for the release of the report on the CIA's use of torture against detainees during the Iraq and Afghanistan wars. She released her request on Friday. “I am particularly struck that the alleged bombers made use of online bomb making guides like the Anarchist Cookbook and Inspire Magazine. These documents are not, in my view, protected by the First Amendment and should be removed from the Internet,” said Feinstein in a statement. The publication which Feinstein would like to ban are Inspire Magazine, published by Al-Qaeda in the Arabian Peninsula, and The Anarchist Cookbook, a countercultural publication written during the 1970s which provides instructions on surveillance, making explosives, the destruction of bridges, ways to commit murder, making lethal gas, wiretapping, and the use of guns and knives. “Under the weapons section on knives the notebook includes the following instruction. The heart is another fatal spot to be considered in your attack. A sharp thrust will usual slip off the rib cage and penetrate the heart. This type of thrust should end in an upward swing,” UPI quoted from the Cookbook in 1971. Feinstein's remarks came a day after the arrest of two women in Queens, New York. Their arrest followed a sting operation by an undercover officer who was wearing a wire during a joint operation between the FBI and the New York Police Department. According to TechDirt, the FBI's complaint against Velentzas and Siddiqui says it is their own undercover agent that introduced the two women to The Anarchist Cookbook. The agent reportedly printed out parts of the book that they would need, and the same agent provided them with a copy of Inspire. Neither of the women knew about the publications or downloaded the information from the internet. “The arrests of two women … remind us that the threat of terrorism inside the United States endures. We must remain vigilant against these types of attacks and place a high priority on tracking and interdicting such plots,” said Feinstein in the statement. She commended the work of the FBI, the NYPD and the US attorney for Eastern District, Loretta Lynch. Lynch is President Obama’s nominee to be the next attorney general. The accused women, who appeared briefly in court Thursday, did not enter a plea and are being held without bail until they are due back in court on May 4. If they are found guilty they could face life in prison.